Although I'm happy to answer questions posted via the website comments section, IDP Forum, and email, I'm often quickest to respond via Twitter. So if you have IDP questions, it's a good idea to Follow me on Twitter. Let's start things off by going through some IDP news, notes, and commentary from Week 10 of the NFL season. Ziggy Ansah missed last week's game with a back injury and will be questionable heading into the Lions' Week 11 game. Jerry Hughes left the game early with a shin injury and did not return. He goose egged owners for the second consecutive week. Brutal. Frank Clark left the Seahawks game early with a hamstring injury and did not return. His status for this week's game is up in the air. We should find out more information over the next couple of days. Sean Lee re-aggravated his hamstring injury eight snaps into the Cowboys vs. Falcons game and did not return. He has a history of soft tissue injuries and missed multiple games earlier in the year due to a bad hamstring, so there's a good chance he misses Week 11 and even a game or two after that. Bears linebacker Danny Trevathan was somewhat of a surprise inactive this past Sunday as he struggled to recover from a calf injury. In reading the reports, it sounds like he has a good shot at returning this week. Will Compton has a Linsfrac injury and could be a candidate for injured reserve. Jaime Collins will miss the remainder of the season with a torn MCL. Joe Burgess will take over for him and be close to an every-down player. A.J. Klein left last week's game early with an ankle injury and did not return. Manti Te'o played every down in his place. DB1 Tyvon Branch tore his ACL on Thursday Night Football and will be out for the rest of the season. Vontaze Burfict made contact with an official and was ejected from the Bengals' game in the first half. He won't be suspended but it's just another example of Burfict's risk. Nick Kwiatkoski got the start with Danny Trevathan shelved with a calf injury. He exploded for a 9-1-1 stat line. However, he's not someone that you should put much waiver wire interest in as he's going to head back to a timeshare with Christian Jones once Trevathan returns (likely this coming week). Jonathan Casillas returned to the starting lineup after missing a few games with an injury. He was the team's only every down player. B.J. Goodson figures to return to a near every down role alongside Casillas once he's healthy enough. Many (including myself) considered Bernardrick McKinney a solid LB2+ entering the year. However, astonishingly he's only registered more than four solo tackles once this year and hasn't garnered a sack since Week 2. His tackle numbers are down significantly as the team is using him to rush the quarterback a ton. He's someone that's unfortunately devolved into a boom/bust LB4 for owners. Safety Adrian Phillips appeared to continue playing his hybrid safety/linebacker role despite the return of Denzel Perryman. However, Hayes Pullard was out of the game so it will be interesting to see if Phillips continues that role moving forward when both Pullard and Perryman are healthy. My guess is he goes back into a reserve safety role. 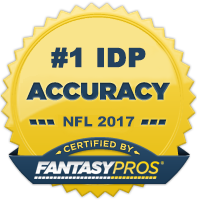 Now onto The Guru's IDP waiver wire selections for Week 11! DE Olivier Vernon (NYG) - Vernon finally returned to the starting lineup after missing the last month plus with an ankle injury. He had 4 total tackles, an interception, and a pass deflection in his return. I've noticed he was dropped in a fair amount of leagues due to his extended absence. If that's the case, he's someone you should seriously entertain putting a bid in for as he should be a top 20 DL moving forward. DE Emmanuel Ogbah (CLE) - Ogbah is a player I liked as a good value play heading into the season and although he's been a bit up and down, he's coming off a two-sack performance last week and finds himself as a top 25 fantasy lineman in most scoring systems. With Myles Garrett already playing at an elite level, Ogbah will continue to see a ton of one-on-one matchups and I think he can maintain his current level of production and finish in that DL20-30 range. DE Frostee Rucker (ARZ) - This is admittedly a bit of a long shot call; however with the top three most sacked teams all on bye this week, there aren't a lot of great matchup options available. Rucker had a sack last week and goes against the Tom Savage-led Houston Texans who are giving up the most points to opposing defensive ends and have been sacked the fourth most in the NFL. He's not a player with huge upside but he has a pretty good chance at notching a sack in back-to-back weeks. LB Denzel Perryman (LAC) - After an extended stay on injured reserve, Perryman was activated for the team's Week 10 contest against the Jaguars. Despite playing only 55% of the snaps, he led the team with 9 total tackles (8 solos). That snap percentage will go up as over the next few games as he shakes the rust off, making up a nice linebacker add for most teams. He should be a solid LB2 the rest of the way. LB Anthony Hitchens (DAL) - It looks like Sean Lee is going to miss multiple weeks after re-aggravating his hamstring injury against the Falcons last week. This makes Hitchens an every down player with not a ton of tackle competition around him. He's played fairly well since returning from injury and should be the Cowboys leading tackler while Lee is out. Consider him a LB3 during this time. LB Martrell Spaight (WAS) - Coach favorite Will Compton seemed to overtake Spaight for the full-time role at inside linebacker next to Zach Brown; however, Compton suffered a foot injury last week and could miss the remainder of the season. This launches Spaight into an every down role where he should be a viable LB3-/LB4+ on volume alone. S Budda Baker/Antoine Bethea (ARZ) - The Tyvon Branch injury is a devastating blow for fantasy owners as he was a strong DB1 for us all season. His misfortune however opens the door for other players to rise to fantasy relevance. Although Budda Baker stood out in the box scores and should have value in his own right, Antoine Bethea is likely the safety to own now. He's a solid veteran player who now becomes an every down safety. He's registered 70+ solo tackles in eight of the last nine seasons, so he's as reliable as they come. Baker, on the other hand, will see a big bump in playing time but those snaps will likely come in three safety sets (which the Cardinals use a lot of) so he will be more of a boom/bust option. S T.J. McDonald (MIA) - McDonald returned to the starting lineup after missing the season's first nine games after serving an eight-game suspension for a 2016 DUI arrest. Despite the long layoff and his inability to practice with the team over the past two months, McDonald came out hot leading the team in tackles with 9 and narrowly missing an interception. He's shown to have DB1 potential in the past and is in a decent situation to put up top 20 DB numbers the rest of the season. He should be one of your priority IDP waiver wire pickups this week. S Eric Reid (SF) - This is Reid's third appearance in this article this year (hopefully the third time's the charm). Reid is coming off his best game of the year in which he registered 7 solo tackles, an assist, a fumble recovery, and he deflected a pass. With the 49ers ravaged by injury at the safety position, Reid is finally a clear cut every down safety and should see plenty of tackle opportunity on a defense that spends a lot of time on the field. For those that like steady tackle production out of their fantasy DBs, Reid is a solid DB2-/DB3+ option.